The challenge for foodservice operators that produce local, organic, farm-to-table, or natural or any food that fits under this umbrella is to serve it on dishes that live up to the food. The experts at Tuxton China have released their Artisan Collection to try and live up to the challenge. Artisan displays a distinct combination of art, nature and craftsmanship. 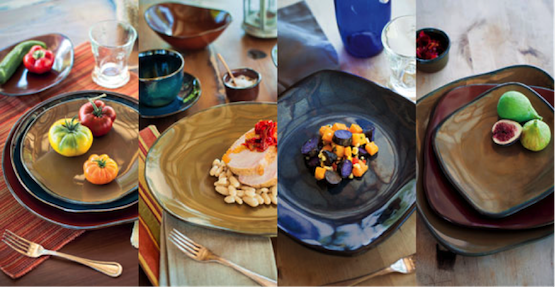 The collection, which comes in three colors, features lush, vibrant glazes that react differently with each firing making every piece unique. Under the glaze, each piece has a hand-thrown feel to it to emphasize its rustic and unique feel. Artisan’s colors are inspired by the deserts of California, include Mojave, Night Sky and Red Rock. The line features 14 pieces including round and square plates, platters, trays, bowls, cups, mugs, a creamer and a tea pot. For more on Tuxton’s rustic Artisan Collection, click here.